Dorphan is developing a small molecular weight drug candidate for the treatment of GM1-gangliosidosis and mucopolysaccharidosis IVB. This compound was already evaluated in clinical studies for another rare, orphan and pediatric indication. In many cases, genetic mutations in lysosomal enzymes lead to improper folding and destabilization of the proteins which are degraded instead of being transported to the lysosomes where they normally express their enzymatic functions. In the absence of the lysosomal enzyme, cellular debris accumulates, producing progressive damage leading to the disease. 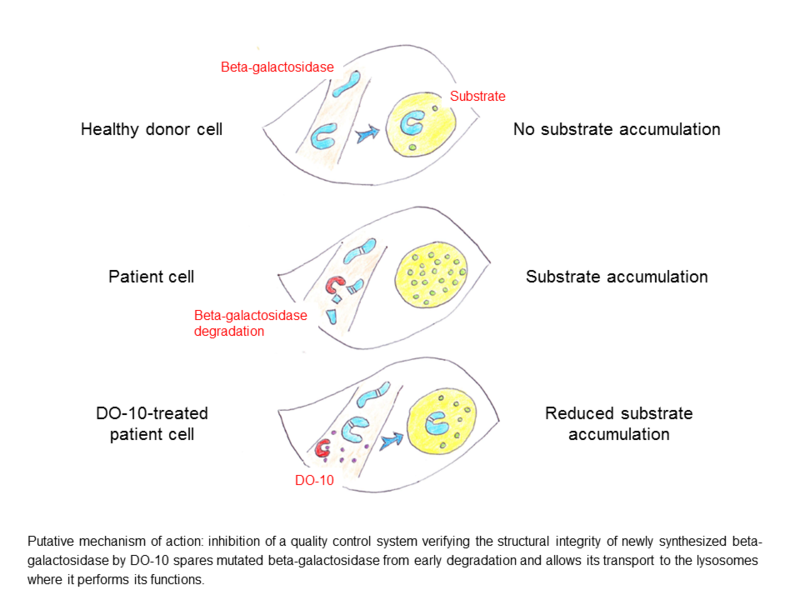 The drug candidate being developed by Dorphan functions by preventing premature degradation of the mutated beta-galactosidase, favoring thereby its transport to the lysosomes where it can express its enzymatic activities. Current treatments such as enzyme replacement therapy, are only available for a small subset of lysosomal storage diseases and have not been effective at treating neurological symptoms, as tissue accessibility and cellular penetration can be limited. The bones and central nervous system are very difficult to access for large protein therapeutics. Substrate reduction therapy is another therapeutic solution already exploited for Gaucher disease, and gene therapy is currently tested for several lysosomal storage diseases with programs at the early stage of development.